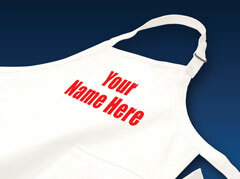 Aprons are full-length, have a front pocket and are one size fits most. Minimum order quantity is 24 per design. Additional set-up/artwork charges will apply.